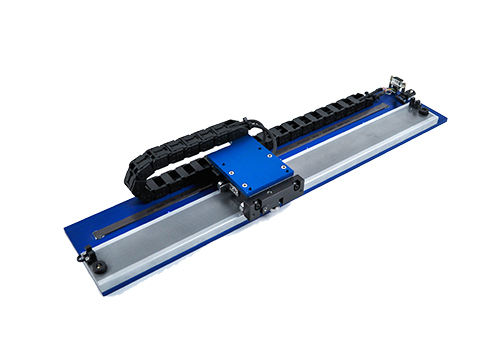 The LSS-016-04-006-01A-ME is a revolutionary new series of low profile linear stepper positioning stage that integrates an absolute linear encoder into the single-axis linear stepper motor stage to operate the linear stepper motor as a 2-phase brushless linear motor, when coupled with state-of-the-art motion control electronics package provided by H2W. This allows stage to achieve speeds, accelerations, and accuracy previously unachievable with a standard open loop linear stepper motor. When operated this way, the motors will tend to run cooler as they will only draw the current needed to hold the desired position or make the desired move. Using absolute encoders removes the need to use home position sensors as the absolute position of the system will always be known, even after power is cycled. It uses H2W linear stepper motors STS-0620-R to generate a force of 6.0 lbs [26.7 N] with a total stroke length of 16 inches [406mm]. The 1.0-micron (absolute) resolution encoder allows for precise positioning. The moving motors and encoders have high flex power cables guided by a cable carrier. Motor and encoder cables are terminated into standard D-subminiature connectors. It has end-of-travel limit switches to provide electrical protections. There are also provisions that allow customer cables to be routed within the cable carrier. Custom mounting holes on the moving table and base are available upon request at no additional charge.